Today, I bring to you my take on this month's Kulinarya Cooking Club Challenge. For those of you who haven't heard of Kulinarya Cooking Club, it is a group of foodies who are passionate about the Filipino culture and its colorful cuisine. You know that my blog's main objective is to share the goodness of Filipino Cuisine, so I'm sure you can imagine how proud I am to be a member of this awesome club! Each month, the club showcases a Filipino dish with the hope of sharing its members' passion and love for Filipino food. For this month, the chosen theme is Arroz Caldo which is one of the most favorite comfort food among Filipinos. Arroz Caldo which is often thought of as one of those Filipino dishes that's of Spanish origin came from the Spanish words, Arroz which means "rice" and Caldo which means "broth"), but is actually an adaptation of the Chinese congee or porridge. It is a thick rice porridge that is flavored with garlic, ginger, onion and safflower (kasubha). The latter is our local saffron which gives Arroz Caldo an appealing aroma and a bright yellow tinge. ...so for this month's Kulinarya Challenge, I thought of making another version which I call "Arroz TapLog". It's Arroz Caldo with Tapa (Cured Beef) and Itlog (Egg). It's kinda like my favorite breakfast, Tapsilog, but in this one, I paired the beef and egg with Arroz Caldo instead of sinangag (fried rice). Thoughts of my mom's tender loving care inspired me to create this Arroz Taplog for Kulinarya. 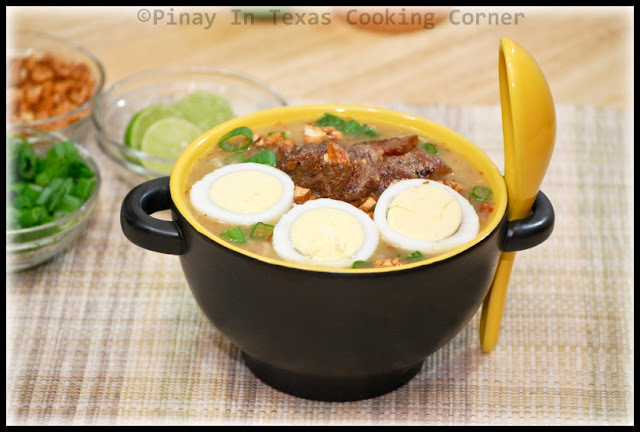 The flavor of beef tapa gave a twist to the usual Arroz Caldo that my family enjoys. But I must tell you that no matter what meat is in your Arroz Caldo, it will always bring that comforting and healing effect to your body! The flavors of garlic, ginger, onion and safflower combined with rice and broth is what makes it so filling and satisfying! Whether you're feeling under the weather or just having a tough day, a nice hot bowl of Arroz Caldo will definitely make you feel better! Don't miss our Macy's Thanksgiving Giveaway!!! 1. In a large soup pot over medium heat, saute garlic in 2 Tbsp. olive oil until light brown. 2. Add ginger and onion, and sauté for a minute. 3. Add beef cubes and stir until it melts. 4. Add rice, water and fish sauce. Mix well. Cover and simmer in medium heat for about 40 minutes or until rice is fully cooked. Stir occasionally. 5. Meanwhile, in a skillet over medium heat, fry beef in remaining olive oil until cooked. Remove from skillet and set aside. Chop about 6 strips and add to the rice soup. 6. When rice is cooked, add safflower and white part of the green onions. Add salt and pepper to suit your taste. Simmer for another minute. If rice soup becomes too thick, add a little water to thin it a bit. 7. Remove from heat. Ladle to individual serving bowls and top with tapa and egg slices. Garnish with green onions and fried garlic, and sprinkle with lemon (optional) before serving. Don't forget to check out other Kulinarya members' take on Arroz Caldo for our October-November challenge! I love this. This looks SO good. Tina, I've enjoyed visiting your blog & learning about your culture. Thks for introducing me to Arroz Caldo! Enjoy your weekend, dear! I have not heard about this recipe before Tina but sure some similarities with our porridge, nice with the eggs on top and a complete meal for the day, saving time then cooking individual dishes to go with the rice. you always come up with such amazing recipe and those egg boils are calling me like crazy. The presentation and that bowl is a lovely prop you used. 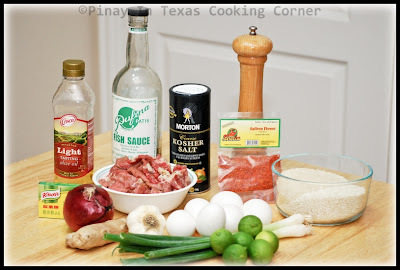 I like the beef tapa recipe, there is quite a number of dishes you can make with just that. The rice dish here does look tasty. Funny that I do not have that many recipes that have a beef broth. It is usually chicken or veggie. However, this dish does inspire and trying out different cuisines in the kitchen is always fun. I love congee, Tina, I am sure I would love this Arroz Taplog too, looks terribly yummy :)!! 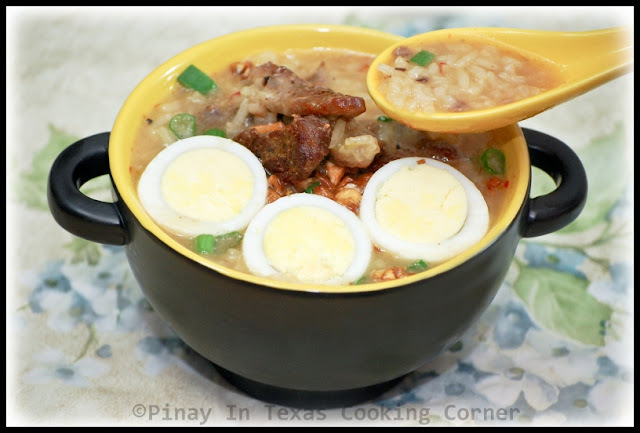 Yum, yum...first time I've seen a beef arroz caldo and it looks sooo delicious! I have never seen that take. It looks great. love you take tina. i would get a spoon and spoon out the taplog goodness! YUM! I love the tapsilog version! Very creative. This is so, so delicious, Tina. A double whammy of goodness. Best thing about arroz caldo are the toppings. What else can beat beef tapa? Love the beef tapa/egg combo as topping. So yummy! 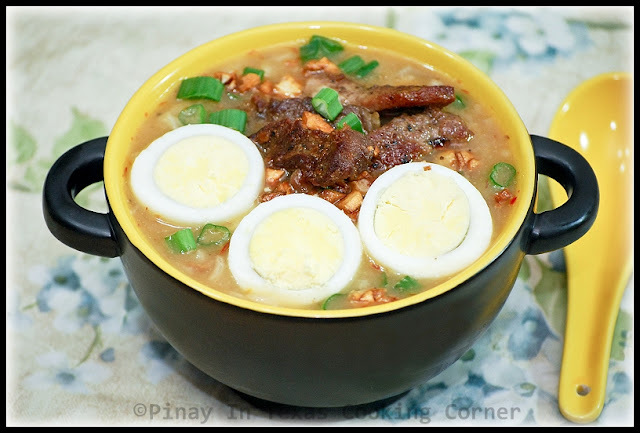 Love all those egg slices floating in the lugaw! And all those toppings make it just amazing! And I love your soup bowl with the spoon! Where did you get that? Thanks for sharing the recipe. Glad to cook along with you on this KCC challenge. Happy Thanksgiving! Oh wonderful! How delish that dish looks- wow- you continue to amaze me my friend! Your tapa topping reminds me of beef pares.. 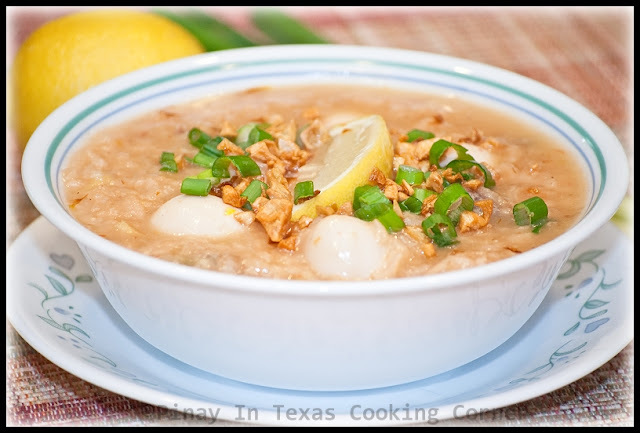 Your arroz caldo looks so yummy! tapa and lugaw.. two of my fave dishes in one! thanks for sharing! saktong-sakto ang taplog arrozcaldo mo dito sa baguio since it's very, very cold here already.